Songs from music manuscripts were in great demand in the middle ages, and they circulated in many different ways: orally, notated by trained scribes or given as a gift. The paths of repertorial exchange can be traced across the whole of Europe by the many concordances found in music manuscripts. A change of repertory in a monastery or cathedral was often connected with a desire to take part in the musical innovation of the time, or to implement prescribed reforms. This new music in turn attracted the faithful and pilgrims in greater numbers. Many European monasteries and cultural centres, such as the cathedrals of Stantiago de Compostela in Spain and St. Andrews in Scotland, profited from the increasing flow of pilgrims. Notre Dame Cathedral in Paris had already developed an entirely novel polyphonic repertoire, which soon attracted many admirers from throughout Europe. The English scholar known as Anonymous IV, for example, vividly describes the enormous appeal the musical innovations of Magisters Leonin and Perotin had for many of his contemporaries. In consequence, several similar manuscripts of large parts of this repertory have come down to us. One manuscript was removed far away to St. Andrews, and was probably in part also written there. Besides many concordant pieces in its 13th fascicle are a series of unique tropes (special textual and melodic amplifications) that did not find their way into the younger, continental manuscripts influenced by Notre Dame. Our programme contains three-part tropes from this group of unica. Another widely disseminated layer of tradition consists of Kyrie tropes, whose particular texts survive with their original melody as well as in polyphonic settings. We also find these in St. Andrews, as well as in St. Martial de Limoges, Santiago de Compostela and Notre-Dame de Paris. Another genre, the verse compositions that were newly developed in Aquitaine in the 11th and 12th centuries, turn up again in French and South German manuscripts. A famous example, “Veri solis radius”, has been chosen for the title of this concert. The present programme demonstrates the manifold relationships between European cultural centres, especially the flood of music exchange - even over great distances - and the mutations that the music underwent in the process. usserthal Abbey (German: Kloster Eußerthal) was a Cistercian abbey in Eusserthal near Annweiler am Trifels in the Rhineland-Palatinate, Germany. All that now remains of it is the front portion of the abbey church, which is now used as a parish church. The abbey was founded in 1148 by a knight, Stephan of Mörlheim, and settled by twelve Cistercian monks from Villers-Bettnach Abbey in Lorraine (of the filiation of Morimond). The monks' first task was the clearing of the river valley, to make it cultivable. In 1186 Emperor Frederick Barbarossa put the monastery under Imperial protection. It subsequently received rich gifts, including many vineyards in the south of the Palatinate. A village quickly grew up round the monastery. The monks served at Trifels Castle as chaplains, and watched over the Imperial Regalia while they were kept in the castle during the 12th and 13th centuries. Eusserthal never founded any daughter houses, but it had a priory at Mörlheim. After that the importance of the abbey declined. In the 15th century it was looted several times. In 1525, during the German Peasants' War, it was looted and set on fire; it was rebuilt in 1552 under Abbot Martin II. In 1561 Elector Frederick III dissolved the abbey in consequence of the Reformation. In the 17th and 18th centuries several attempts were made to revive the monastery, but without success. The building of the church is thought to have been begun about 1220; it was dedicated in 1262. The plan and basic structure are Romanesque but the vaulting shows Early Gothic influence. In accordance with Cistercian custom the church has no towers, just a flèche, or miniature spire, over the crossing, and the interior is without colour. The construction is of local red sandstone. The structure is of a pillared basilica of three aisles and a transept on a Latin cross ground plan. The vaults in the nave and the choir are secured by open buttresses. The resemblance to the church of Otterberg Abbey, which was built earlier, is unmistakable, although the church at Otterberg is larger. The conventual buildings and the cloisters have disappeared, and of the church there now remain only the choir, the transept and the first bay of the nave. In the wall of the choir is a rose window with tracery, and over the arch of a door a well-preserved relief sculpture of a dragon in sandstone. In the 18th century the remains of the abbey church were re-worked as a parish church. At that time the upper window openings were closed and the ruins of the bulk of the nave were demolished, and replaced by a simple west front. The acoustics of the resulting building are ideal for the performance of church music, and the summer concerts held here are well-known. In 1961 substantial restorations took place, which have had the effect of emphasizing the Romanesque character of the structure. OX NOSTRA is a vocal ensemble based in Berlin, Germany, founded in 1999 by Burkard Wehner. Specialized in the performance of medieval music the main focus of the group is the interpretation of the earliest surviving compositions from the cultural centers of Europe. Sung from manuscripts originating in monasteries, cathedrals, and courts, this music is an acoustical insight into the archaic sound world of the Middle Ages. The members of VOX NOSTRA have pursued extensive scholarship in the fields of musicology, medieval paleography, and theology. The music of VOX NOSTRA combines expressive musicality and academic curiosity. The repertoire includes Gregorian and pre-Gregorian chant and the specific liturgical music of the different medieval orders like Cistercians, Dominicans, Carthusians and Franciscans dating from the 10th to the 14th century. Furthermore VOX NOSTRA sings early 12th century polyphonic compositions from St. Martial (Aquitaine), compositions from the famous cathedral of Notre-Dame de Paris (starting from 1200), Italian laude of the 13th century, and the richly polyphonic compositions of the Renaissance. 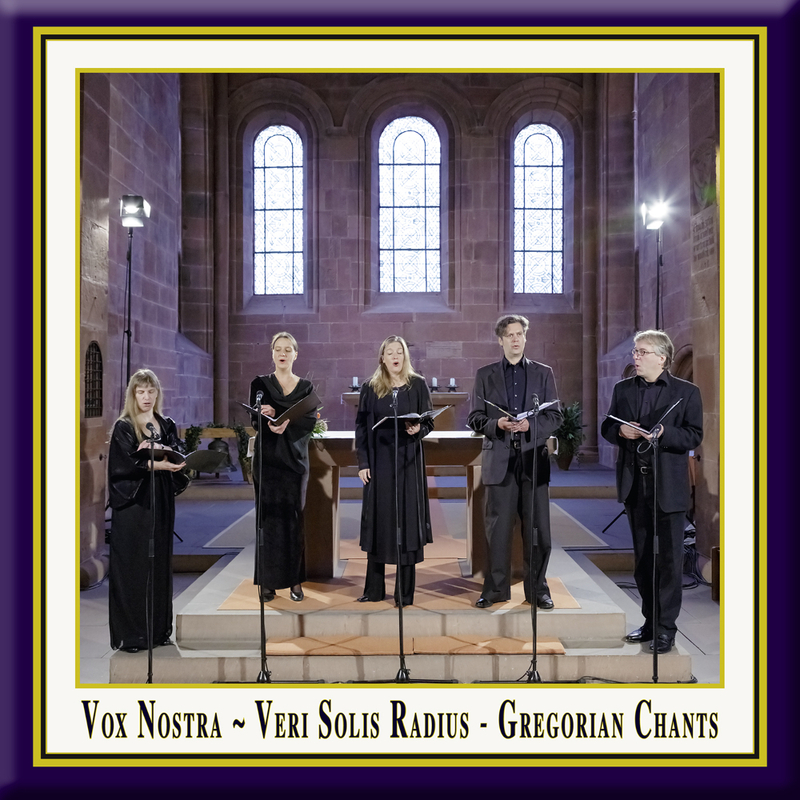 In addition to Early Music, Vox Nostra interprets contemporary music, devised and composed to experimenting with vocal color and microintervals. In both old and contemporary music performances VOX NOSTRA regularly collaborates with lighting designers, and other visual artists, in order to enrich the visual and theatrical aspects of the performance. A special feature of the ensemble is the practice of singing scores researched from original manuscripts. The musical interpretation made by VOX NOSTRA has specific consequences on the old forms of notation, such as neumatic notation of the chorale, the modal notation of the Notre-Dame organa, and mensural notation. Which each employ a great number of symbols indicating that melodic ornamentation that should be sung. In order to give these features the emphasis they deserve, ensemble VOX NOSTRA favors a slow, flowing style of performance in an appropriately restrained tempo. The vocal sound which results is rich in overtones, and fills the entire space; it allows the archaic and pure intervals of this music to be fully appreciated, and ensures that the complex weaving of the individual voices is clearly audible. In addition to the original manuscripts, research and this interpretation of the music from the 12th-16th centuries also provides new information the regarding tempo, ornamentation and the practice of solo performance of the chants. The music of VOX NOSTRA is best suited to a large space with a good acoustic and hence no amplification is required. Churches are of course suitable for the liturgically structured programs, yet more modern settings like galleries, or industrial sites also provide a provocative backdrop for the music. The unique acoustical situation of each concert location influences concert presentations, as well as the choreography of singers, hence time in each venue to work how the singers can move between various points in the room to integrate the acoustic properties of each site into the score. my Green: Born in Alamo, California, U.S.A. 2001 Early Music Voice Degree, Staatliche Hochschule für Musik, Trossingen. 2001 Private study of medieval harp, with Judy Kadar, and, Arabic Music, with Farhan Sabbagh. Solo and ensemble singer in diverse contexts including: Member of ensembles Green/Sudmann (Contemporary Art Song), Elysium (Vocal ensemble. Recorded for Decca), Kusskuss (Early Baroque music), Teatro de Liezenbourg (Baroque Opera. Played lead Role of Procride in modern premier of Giovanni Bononcini´s opera Cefalo e Procride). Collaboration with Sarband, Ensemble Penalosa, Ordo Virtutum, Alta Musica, Friedrich Lichtenstein (Boccia Saal, Carmen Miranda Revue Pavillion, Park). llen Hünigen studied composition and piano at the Music Conservatory Hanns Eisler Berlin from 1985 till 1989. Contemporary music courses (International Bartok Seminar in Szombathely, Hungary, 1989 composition prize at the Geraer Ferienkurse für zeitgenössische Musik. From 1989 to 1991 advanced studies in composition with Friedrich Goldmann at the Akademie der Künste in Berlin. Diverse composition stipendia. Since 1990, teacher for music theory and piano at various private and public schools as well as at the Music Conservatory Hanns Eisler. Her own music has been performed by various ensembles in Germany, Switzerland, Italy and USA. Member of the vocal ensemble Musikalischer Religionsdialog which aims to connect and to interweave music of Jewish, Catholic, Orthodox Christian, Byzantine and Muslim traditions. Since 2008 working on a dissertation on musical notation in Aquitanian music manuscripts of the 12th century. usanne Wilsdorf: Study of musicology in Berlin. Awarded with a stipendium for study in Basel with Wulf Arlt. Study of voice at the Akademie für Alte Musik/Hochschule Bremen with Harry van der Kamp. Ensemble Singer: Collegium Vocale Gent, Las Huelgas Ensemble, Vocalconsort Berlin, Musica Fiata Köln, LauttenCompagney Berlin. Collaboration with Philipp Herreweghe, Rene Jacobs, Marcus Creed, Attilio Cremonesi. Concert touring in France, Israel, Luxembourg, USA, Syria, Sweden. Participation in diverse productions of Sasha Waltz & Guests (Dido and Aeneas, Medea- Dialoge 2006/2009). erner Blau: Music and geography teacher in Berlin. Pedagogical and performance degree in piano under Thea Boue-Noack (Mainz). Private vocal instruction with Bettina Spreitz-Rundfeldt, Ralph Eschrig, Evelyn Tubb und Stephen Varcoe (Dartington Summer school). Solo and ensemble bass (focus Early Music). Pianist / accompanist of Lied repertoire of the 19th and 20th century. urkard Wehner - Founder and music director of the ensemble Vox Nostra: Study of Medieval and Renaissance Vocal Music and musicology at the Brabant Conservatory in Tilburg, Holland. International master classes with Andrea von Ramm, Jill Feldman, Marcel Peres and Pedro Memelsdorff. Soloist at many international festivals in Poland, Holland, Austria, France, and Germany. Extensive musicological activity in the research of medieval source material. Teaches workshops and seminars on the interpretation and performance practice of medieval vocal music. Member of the advisory board for the exhibition 'The Council of Constance 1414-1418' in Constance from April to September 2014. Concert Date: September 8th, 2013. A concert hosted by "Kultursommer Rheinland-Pfalz" (Cultural Summer Rhineland-Palatinate) and the Catholic parish "St. Bernhard" Eusserthal, recorded, released & created by Andreas Otto Grimminger & Josef-Stefan Kindler. The first word that comes to mind on listening to this CD is haunting. As a procession entering into the abbey church (St. Bernhard, Eusserthal, Rhineland-Palatinate) we initially hear a distant group of singers approaching, as they get louder and fill the space with their resplendent voices we settle into a transcendental journey across ancient medieval Europe. Each of the five singers on this recording is a scholar specialist (musicology, paleography, theology) in this repertoire. They include, Amy Green (USA), Susanne Wilsdorf, Ellen Hünigen, Werner Blau, Burkard Werner (Germany). They gave a concert in the abbey church on September 8, 2013. This CD is a snapshot recorded on site in direct 2-track stereo digital. The sound quality is quite simply amazing. A restored church from what was left of the original ruined abbey Kloster Eusserthal, is widely known in Europe as a great concert acoustic. An ongoing series of performances is presented annually in the former Cistercian monument, near Annweiler am Trifels. Vox Nostra to quote their notes, "…favors a slow, flowing style of performance in an appropriately restrained tempo. The vocal sound which results is rich in overtones, and fills the entire space; it allows the archaic and pure intervals of this music to be fully appreciated, and ensures that the complex weaving of the voices is clearly audible." This writer would have to qualify their approach and the amazing results as revolutionary and without president or rival. I feel like I have heard medieval chant for the very first time it is so startling and overpowering. The repertoire is varied and all taken from original manuscripts in Spain, Italy, Scotland, Germany, England and France. The recording ends as it began. The singers exit the abbey church and their voices trail off into the distance into silence. It is not possible to overstate the importance of this new recording on a label that is almost totally unknown here in North America. 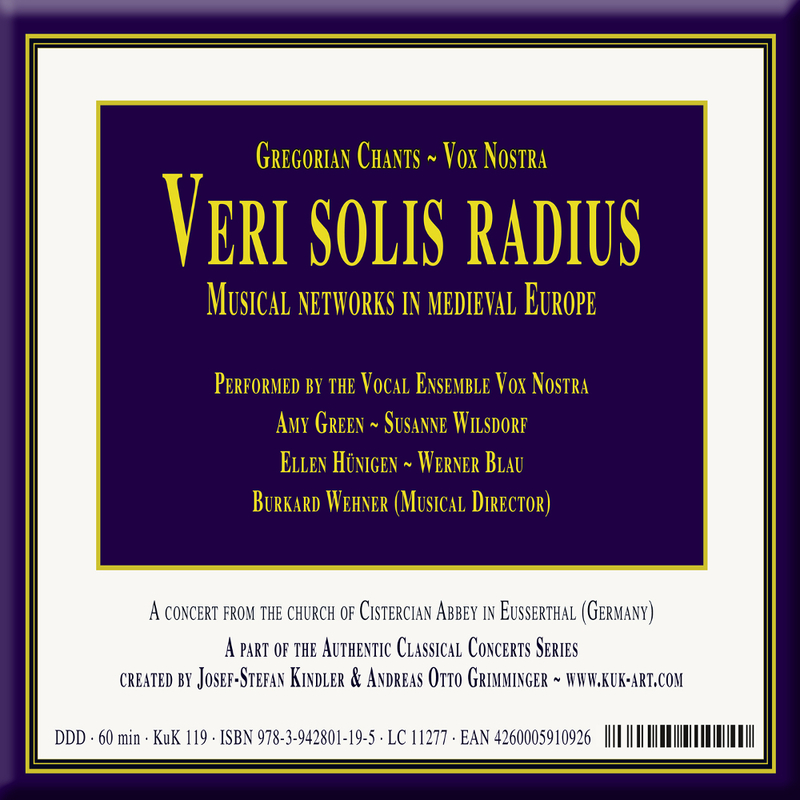 Insist on listening for yourself Vox Nostra's artistic triumph Veri Solis Radius.